RetroRoleplaying.com has a number of old school games available. Most of these games are priced as "Pay What You Want". While we hope you will feel motivated to toss a few dollars our way for these games, "free" is an acceptable price if that's what upou wish to pay. 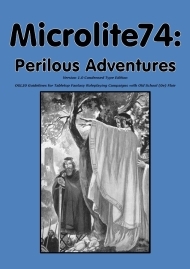 Microlite74, Microlite75, and Dungeon Delving games are based on the original "0e" edition (circa 1974) of the world's most popular tabletop RPG. Microlite81 and BX Advanced games are based on the Basic/Expert versions from 1981, sometimes with some first edition "advanced" material mixed in. Microlite78: first Edition Lite is the Microlite74 system used to create a version of the first edition of the "advanced" rules. Click on a cover illo for more information on that game. RetroRoleplaying.com started out as a site devoted to out-of-print, unsupported, and/or out-of-style tabletop roleplaying games (and modern "retro-clones" of those games). While we have over one hundred pages devoted to this, as of 2010 we are probably better known as the publisher of free Microlite20 variant games designed to reproduce the feel and style of "old school" editions of the "worlds most popular tabletop RPG" including the popular (and free) games Microlite74, Microlite78, and Microlite81. While it may surprise many people, the earlier editions of classic RPGs like Dungeons & Dragons sold many more copies than the newer D20, 4e, and 5e versions. These once very popular games are available in hardcopy via Amazon or eBay (and many are available in PDF)-- and are still being played today. Retroclones are much less expensive, however (often free in PDF form). Many people prefer older tabletable roleplaying games because of their less complex, easier to modify rules and their "feel." While many 3.x and 4e games feel more like playing a computer game around a table with much emphasis on optimal character building and detailed tactical combat, pre-D20 games feel more being in a movie or novel -- the emphasis is what the characters do in the campaign world as opposed to what skills and feats are on their character sheet.